Product Size: 4.75" x 4.75" x 7"
By using Coconut Milk these Cocomels caramels come out unbelievably smooth and creamy; it's an artisanal treat unlike any other, with a delectable and unique flavor. 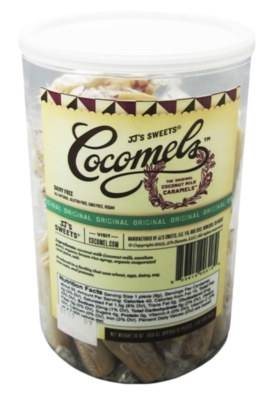 These tubs have a re-sealable lid and contain approximately 92 individually wrapped candies. The wrapper is fully compostable; even Mother Earth likes these candies!